The Calloway Football offensive playbook is a complete and comprehensive offensive system with included in the playbook are over 400 pages. If that seems overwhelming, don’t panic. Most importantly we’ll step you through exactly how to decide which plays to install and when. You’ll start with a handful of foundational plays, and then add new ones each week as you build on top of each play. We will walk through it step by step. You do not have to install the entire playbook to be successful. As an example younger youth teams only have to use a small percentage of the system in oder to dominate their opponents. The playbook is broken down into multiple sections. It is important that you understand the basics and foundation in order to better understand the 29 different families of plays. We will provide you all the tools you need to study, learn and implement the offensive system at any level. Our preferred communication method is hand signals and hot words. Communication typically starts with the play call coming in from the sideline to the players via hand signals. Skill players - WR, RB and QB all look to sideline to get the hand signals from coaches. Offensive Line – The OL does NOT need to look for hand signals. The OL is hurrying to the spot of the ball, getting set and start the recognition to identify the defensive front. QB - will verbally communicate the play call to the OL. • For younger youth teams under the age of 4th grade maybe wrist bands can be used. In our experience wrist bands slow the tempo and pace way down therefore we prefer not to use wrist bands. The entire play is hand signaled in from the sideline. The hand signal order is typically the formation first, then motions, protection, play and tags. ​Only one of the numbers is real. It tells the OL what play is being run. The other number is a decoy — anything in the 50s, 60s, or 70s are automatic decoy because there are no real plays in that number range. The word can be real or decoy. If it’s a recognized play (e.g. Wildcat), then it’s real. If it’s not a real play (e.g. Omaha), then it’s only there to make it harder for the defense. The QB makes up his own decoys. The dummy numbers and words aren’t signaled in. The QB comes up with his own when calling the play. He’ll usually have a few ready that he just rotates through. After the QB calls the play, he gives a signal to the center when he’s ready for the snap. (Usually flexing his hand out toward the ground.) The center makes sure the OL is set and then calls his cadence. The exception to this is when the play calls for a WR to go in motion. On those plays, the QB will call “me me me” to signal to the OL that he is calling the snap count and will call it when the WR is in position. We like using “Hot Words” to pickup the tempo to what we call Turbo speed.. Hot Words are one work meaning everything in the specified play call. We use words like “Alert, Record, NASCAR, and Falcon” and others. Alert - In our system signaling in “Alert” from the sideline tells the offense to immediately run a pre-determined play that we really like against a certain opponent. This play can change weekly based on your opponent. The QB calls “Alert Alert Alert,” and the ball is snapped on the center’s cadence. Example Alert Play: When scouting this weeks upcoming opponent we feel ”Orange 26” will be a good run play for us against their defense. So that becomes our alert play for the week. All it takes is for us to signal in “Alert” and the QB’s verbal command is simply “ALERT, ALERT”. We are snapping the ball at turbo speed and running Orange 26. Record - Calling “Record” simply means to get to the line fast and immediately run the previous play again. Others - Over the course of the season, you can add a more Hot Words for pre-determined plays, formations, and/or motions. You can even game plan one or two specific plays for certain opponents. * We love using a hot word plays like “Alert” after a big gain or big play. Example after a nice 25 yard gain we yell Alert and hustle down the field and snap the ball before the defense is ready. QB is ready - Once the QB is ready for the snap he will give the center a signal like a hand wave or pick his foot up. Center takes control – QB has deliver the I’m ready signal. Then the center is in control of the snap count unless motion is being used. When motion is being used the QB take control of the snap count with a “ME ME ME” call. Freeze Call – We will have a code word for a freeze call like the word “Ice” or “Chocolate”. QB comes up and give the freeze code verbal command “26-32 Ice” “26-32 Ice”. Everyone know we are not snapping the ball. QB give the I’m ready signal and the Center then gives a hard count “SET GO” “SET GO” to try and get the defense to jump off sides. If no off sides – Then the QB and skill players look to sideline and will get a new play signaled in. Bubbles and quick screens are a big part of the Calloway Football offensive system. They allow us to stretch the field horizontally and are used as a extension of our run game. Bubbles Screens – Bubbles screens are what we call our inside WR combo screens like Y and H calls. Quick Screens – Quick screens are what we call our outside WR combo screens like Z and X calls. RB Bubbles Screens – Our RB bubble we call “F” in the system. 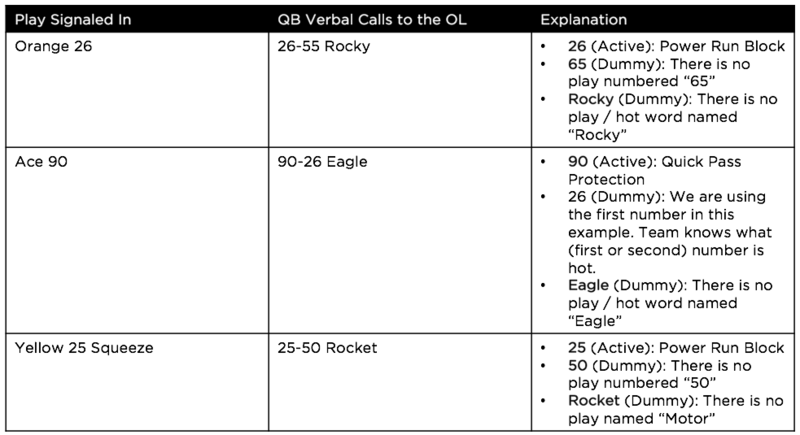 Traditional RB Screens – Our traditional RB screen we call our “Bobcat” screen call. Tunnel Screens – Our Tunnel screens are called “Monster” screen calls to our WR’s. Stutter – Is our screen stutter series by tagging a WR with stutter. Once QB makes his pre-snap read he now has the opportunity to run either 4 (run play) or throw the Z (quick screen) based on best available leverage. Run/pass combos allow the QB to decide whether to run or pass based on his read of the defense. The play call includes both a run and a pass option (In the above example our play call would be (Yellow 26 East Rub Z Vert). Before the snap, the QB will read the defense and then turn to the F to tell him run or pass. At the snap, the F makes a token play fake and slides into his protection slot. On a run, the F simply executes the called run play. Only the QB and F know whether the play will be a run or a pass. The OL blocks for a run, and the WRs run the pass play. Even though we teach a up-tempo spread offense. Do not be fooled. Our success is based and founded in the RUN Game. Specifically the Zone and Power run game is absolutely key to our production and dominance of our opponents. Here are the basic of our run game. We use a numbering system to identify runs. The numbering system below describes what type of run each play is. It allows for a easy identifier to the OL as to the blocking scheme that will be used to run each play. The following is our standard passing series / protection calls based on the type of pass we are running. Our 'Quick Game' is 90 series calls & our 'Drop-Back game is 80 series calls. Pal and Par are our placation calls. For 90/91 and 80/81 passing series plays, the first number indicates the type of pass and the second indicates the position of the RB (which is called the F position in this offense). On even numbers (80/90), the F is to the right of the QB. On odd numbers, he is to the left. This also tells the OL which way we are sliding protection. The OL slides away from the side the F is on. Or we have teams that prefer to have the OL slide to the odd or even number and the RB (F) lines up opposite. Either way the bottom line is the RB (F) lines up opposite the OL slide and floors his protection rules or play call rules. There are five play-action families of play-actions calls. BTW - Cowboy is one of our favorite and most successful play-action plays. No dummy #s; both are active. Misdirection play. Can be run both directions with split-back flow. In many cases, you’ll want to call different plays for the receivers to the left of the line and the receivers to the right of the line. To do that, you use directional calls. North specifies that the next word in the play refers to the receivers to the right. East specifies that the next word in the play refers to the receivers to the left. “80” indicates a drop-back pass. “East Post” indicates that the receiver on the left runs a Post route instead of his normal Vert. “PAR” indicates a Play-Action right. “North Quake” means the receivers to the right run a Quake concept.